as he prepares to set off on this once-in-a-lifetime journey. When my grandfather retired in the 1990s, he bought a bicycle and started doing bike trips around Finland. He was a great storyteller, always ending with a killer punchline, and my brother and I would love laughing at his adventures and mishaps. Back then, as a kid, I remember thinking I’d like to do long bike trips just like him. About six years ago he told me I should start cycling, and that I could have his old bike. I think he saw I wasn’t living very healthily at the time and was subtly trying to get me to spend some time outside. That turned out to be the last time we spoke because he passed away soon after. I inherited his old bicycle and discovered I actually quite enjoyed cycling myself, and over the last few years have been touring for a couple of months every summer. Not with his old bike, mind you — I bought my own proper touring bike. It would’ve been nice to say I’m touring with my grandfather’s old bicycle, but it wasn’t comfortable enough for long journeys and it was hideously colourful. Grandpa didn’t have much of a sense of style. But he gave me an amazing hobby, and I’m very grateful for it. 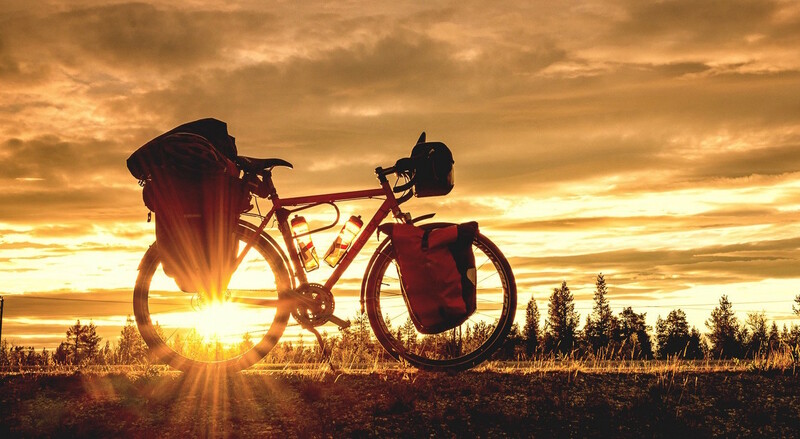 What I appreciate about bike touring is the feeling of freedom. It’s difficult to describe how locked up in our routines we normally are, and how that realisation comes when you go on a long hike or bicycle tour. Being out in the open air, in touch with nature — there’s a sense of immense freedom that comes from that. Joy and happiness occur much more easily. There are no schedules, no responsibilities, you merely react to the most basic needs. Tired? Rest. Hungry? Eat. Getting dark? Set up camp. There is so much contentment to be found in simplicity. My most unforgettable tour so far was last summer. I had a couple of months of holidays off from school, and wanted to use all of it for cycling. 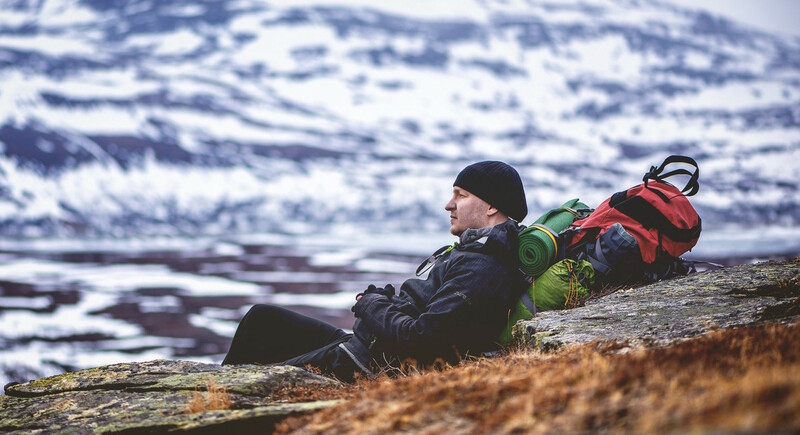 Norway has some of the most amazing scenery in the world, and since I was living far up in North Finland at the time, close to the border, it was an easy decision to make. 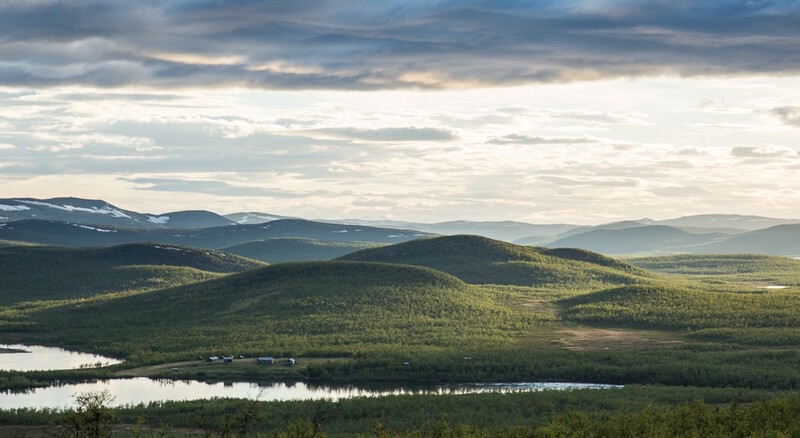 The entire trip happened above the Arctic Circle, and as it was the middle of summer, it never got dark. Most of the time I would sleep during the day and cycle during the night when I had the whole road to myself. Cycling along the fjords and mountains of Norway under the midnight sun, without a soul to be seen. Doesn’t get much better than that. My original planned route was from Inari, Finland to Tromso, Norway, which is about 1000km with detours. While it’s a very low daily average distance, I figured I’d be doing more photography than cycling. Unfortunately, June that year turned out to be unseasonably chilly. The vast majority of the time it was below 10C, cloudy, raining and even snowing early on in the trip. It meant very few photo opportunities, and at times I just kept cycling to keep warm. I think it must be my crazy sense of adventure that inspired me to start planning the 5 Year Bike Trip. And always being disappointed at the end of any bike tour, because it’s over too soon. Even after 100 days on the road, it never feels enough. When I’m on tour I truly feel at home, so I thought, why not continue indefinitely? There are so many places in the world I want to see and photograph. 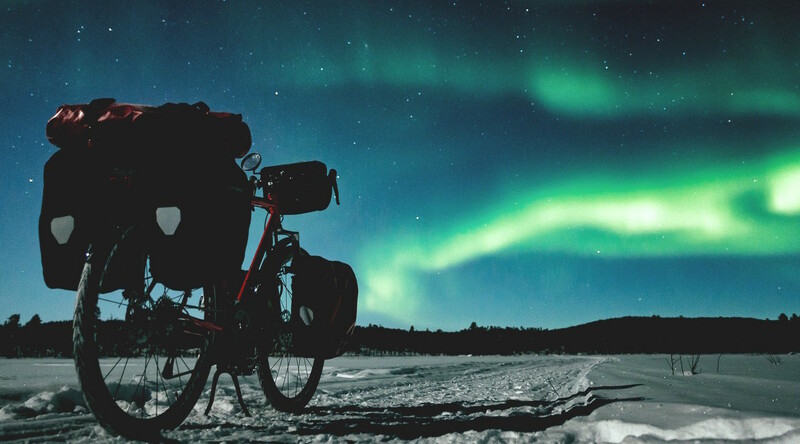 Cycling around the world just seems like the obvious choice. Many people ask me if I’ve planned out a route. While I’m going to be adaptable, I do have a general idea of where I’m going: first I’ll be heading west to the coast of Norway, and then south along the fjords. Through Sweden and Denmark to enter mainland Europe, criss-crossing around there for a year or so. After that I’ll head east to Asia, Australia, New Zealand, then South America and North America. Norway is hard to beat, landscape-wise, but my plan is if I leave Iceland for last, I can always end the trip on a high note. At this point only the first 2 kilometres of my approximately 50,000 kilometre route are set — that’s from my front door to the main road. From there I still don’t know if I’m heading north, west, or south. All are viable choices. I think it’s important to maintain the ability to make last minute changes and react to circumstances, so I don’t accidentally lose the aforementioned freedom to too much planning. Tomi’s map of his journey around the world, updated daily. I’m no daredevil, however. I’ll be researching my route to avoid war zones and other genuinely dangerous areas. Admittedly there’s a couple stretches where safety is a bit questionable, so I’ll be keeping an eye on world politics and make decisions later. In many cases though, I find a reputation for being unsafe is one thing while reality is another. When travelling, fears are often unfounded and I find people are good-hearted and welcoming almost anywhere. And being open to meeting good people on the road is important. It can be hard to leave friends and family behind for such a long time, but I’m lucky that on the whole they have been impressed, encouraging and happy for me. They understand my drive to have this adventure. Having been on a few cycling trips now, my top tip for any bike tour is to go slowly. I think too many people are trying to maximise the distance for their tour. On forums there are so many “Is it realistic to cycle 100km per day, every day, for a month? I’ve never ridden a bike before and have six weeks to train!” type of questions. Even I made a thread very much like that before my first tour! While there’s something to be said for athletic challenges, that kind of approach to a bicycle holiday seems like the surest way to have a bad time. Maximise your enjoyment, not the kilometres. It’s not a race. Go slow. And just enjoy. One question I keep getting asked ahead of my trip is how I plan to pack my bags for the next five years. To be honest, packing isn’t really my strong suit. 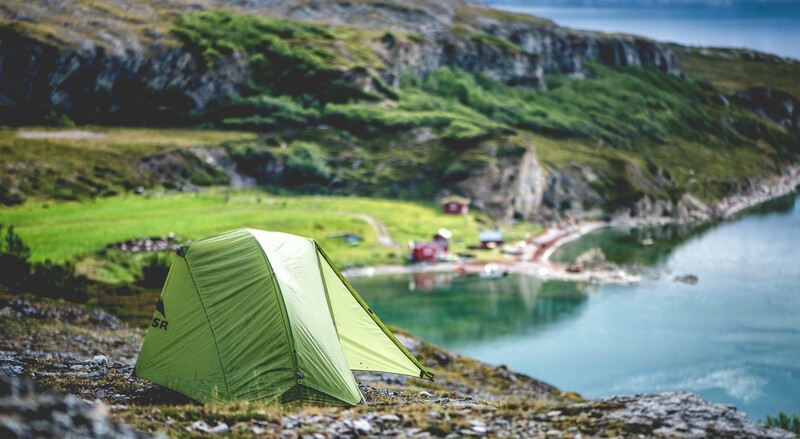 Most people bring too much stuff for the first trip and then reduce things down to essentials as they get more experience. I brought too much stuff for my first tour and even more stuff every year since then. And that’s only partly due to a steady increase in photography equipment. I’m not exactly a fast learner either. It took me a year or two to figure out how important it is to pack all the camping gear on the hard-to-reach bottom bags, since they’re not needed during the day. Nevertheless, my overall strategy is to maximise comfort off the bike. That means a few more warm clothes in case they’re needed. A little too much food and water, in case I feel like taking a day or two off without a trip to the store. And some small luxuries that make me happy. These things are more important than shaving off a kilogram or two. If you’re just trying to get from A to B, then by all means pack light. Bring a credit card and leave everything else. But a tour that lasts for months or years means I’m actually just living my life on the bike. And that’s when speed becomes meaningless compared to a general sense of contentment. I find those extra luxuries to be quite valuable for that. Just don’t interview me during any uphills. The 5 Year Bike Trip hasn’t been inspired by any one person or thing. To be honest, I’m not really a big fan of any one person in particular — I’m a small fan of a million people. Especially anyone with an outdoorsy or adventurous mindset, whether it’s a person I meet on a bike trip, a blogger, or someone on Instagram. I’m also a very visual person, so great travel photography is always inspiring, especially of places like Norway, Iceland, New Zealand, Patagonia and Canada. I’m most excited about visiting these countries, particularly as there are no mountains in Finland, so I absolutely love seeing them when I get the chance! I’m really looking forward to hitting the road and getting this adventure underway. And at the end of the day, if I can whittle down my motivation behind the tour to one driving factor, it’s this: Life is short. May as well do something cool with it. 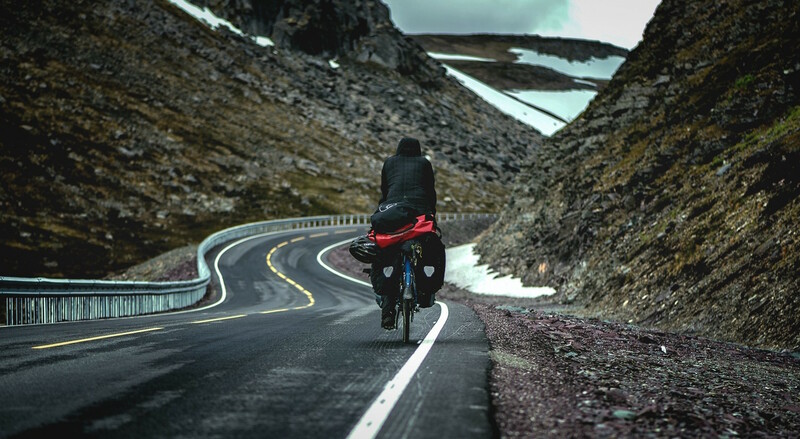 Tomi has embarked on the 5 Year Bike Trip since this interview — follow his journey on his website, keep an eye on his route and get the latest updates via his Instagram and Facebook. Tomi is using Alpaca to track his route around the world. All photographs in this article are by Tomi Rantanen. 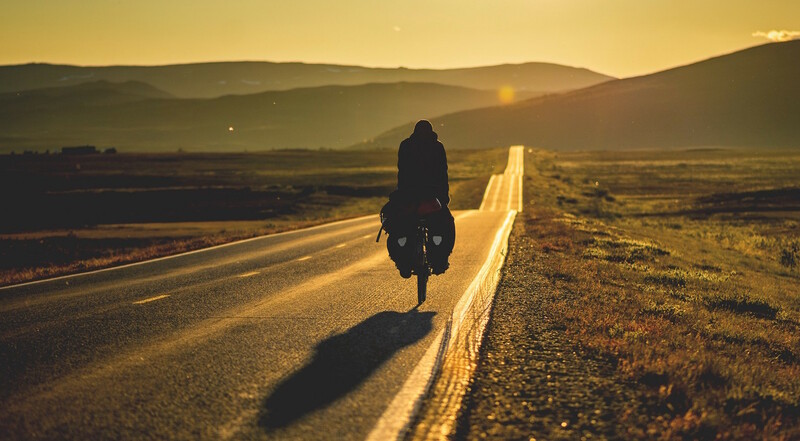 This man is on a 5 year bike trip around the world was originally published in alpaca.travel on Medium, where people are continuing the conversation by highlighting and responding to this story.